Performance tracking of stock picks and 3rd-party assessments of our research. Barron’s featured our recent IPO coverage on Levi Strauss & Co (LEVI). We are March’s #1 ranked stock picker in Healthcare, #3 in Industrials and #5 in Consumer Staples﻿. New Constructs is February’s #1 ranked stock picker in Healthcare, #4 in Industrials and #7 in Consumer Staples﻿. New Constructs is January’s #1 ranked stock picker in Healthcare over the last twelve months (LTM) per SumZero Rankings. On Tuesday, Barron’s featured our recent Long Idea - Keep on Trucking with This Undervalued Stock. New Constructs is November’s #1 ranked stock picker in Healthcare over the last twelve months (LTM) per SumZero Rankings. New Constructs is September’s #1 ranked stock picker in Healthcare over the last twelve months (LTM) per SumZero Rankings. New Constructs is August’s #1 ranked stock picker in Healthcare over the last twelve months (LTM) per SumZero Rankings. On Saturday, Barron’s featured three stocks on our Safest Dividend Yields Model Portfolio. On Saturday, Barron’s featured our research on a recent Danger Zone and the company’s questionable executive compensation plan. 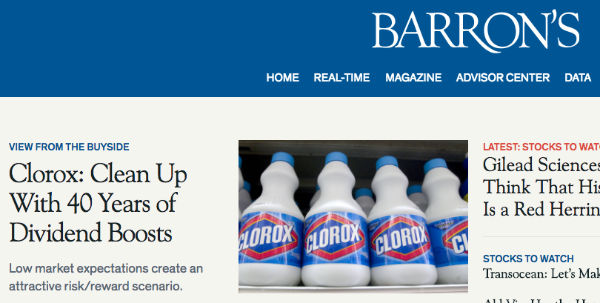 On Saturday, Barron’s featured our research on a recent long idea and the company’s strong corporate governance. On Thursday, Barron’s featured our research on a recent long idea. On Saturday, Barron's featured our research on Verint (VRNT) and the company's misleading use of non-GAAP metrics. On Saturday (3/18/17), Barron’s featured our research for the first time in 2017 and 25th time since 2014. On Saturday (6/29/16), Barron’s featured our research for the eighth time in 2016 and 24th time since 2014. The latest rankings have been released and New Constructs' CEO David Trainer is June's #4 ranked "Value" stock picker per SumZero Rankings.